This top is so cute! I am obsessed with p8ineapples! So fresh outfit. I love the pineapple print. And I'm obsessed with with that jeans. Oh I MUST HAVE this shirt! My kids always quote me, "I LOVE PINEAPPLES!" You've done a great job styling this look, so cute. 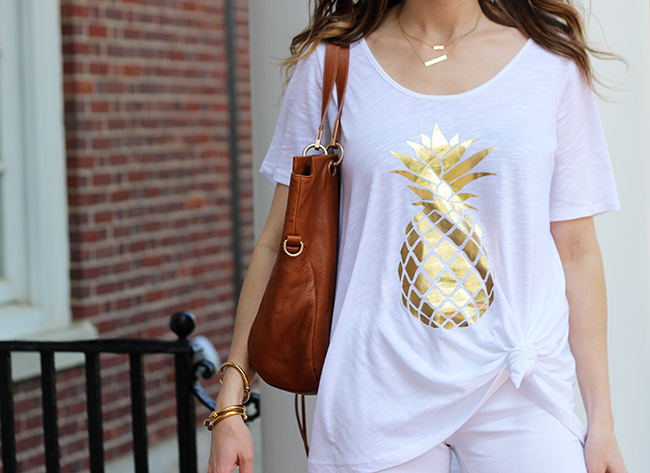 Love all the gold pineapples! Such a great tee and wonderful picks! My daughter has been obsessed with pineapples lately too! They make such a cute print! I love the gold foil on your top! I just got a gold foil printed one from Old Navy I love! Obsessed with pineapple prints. Love how comfy and flowy this top is too!! Such a cute outfit! Love the tee!!! As I only wear gold colored accesories this tee is perfect for me! Haha, okay and on you! Such a fun tee! Love how you knotted it and paired it with white jeans for a monochrome look. cute wedges! such a darling summer look! Your tank is so cute! Have fun at the lake and happy birthday to your twins!! This top is super cute and simple. I could so wear it! I love how simply but chic you look, perfect look for a casual date or day of errands! Such a cute tee! 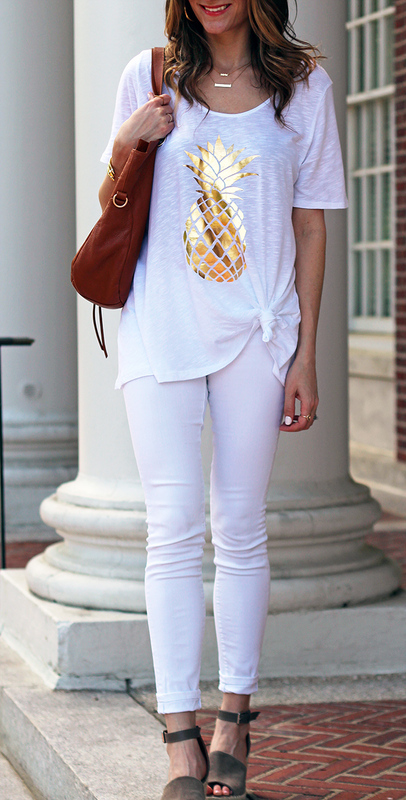 A great way to wear the pineapple trend without being tacky! Just a great t shirt! I love the gold pineapple! How cute is that pool floaty?! I love how easy and comfy that top looks on you! 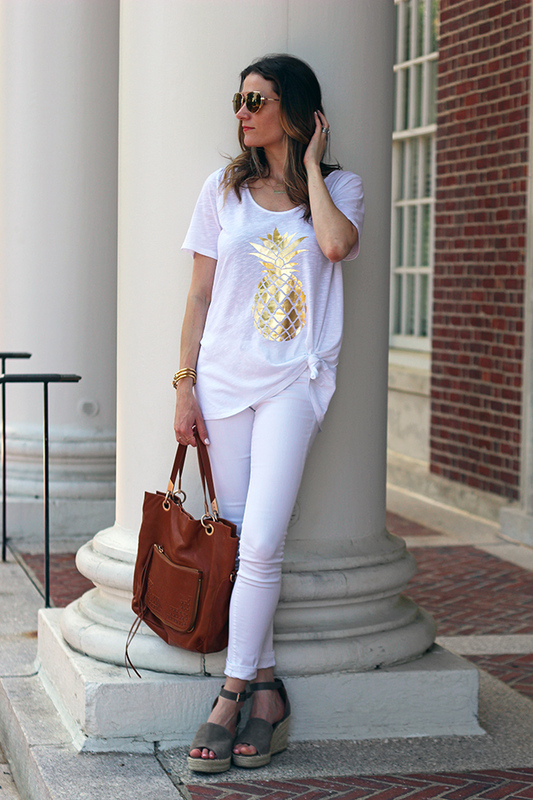 The cute pineapple print is a bonus! 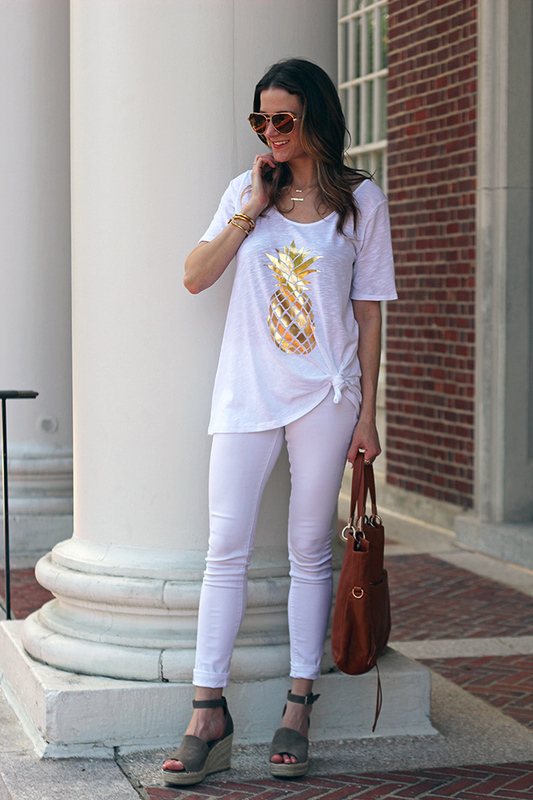 I've been going crazy about pineapple prints lately, and this tee is just too cute! I love the gold foil and how it stands out against your white on white outfit! Too much fun! Loving all things pineapple and the gold foil looks so beautiful! YAY pineapple!!! I love love love it! It's so casual but can also be dressed up! That tee is amazing! Thanks for linking up with Thursday Moda!